TEACHER'S PET WRITING/PRESENTING ACTIVITY: letting the student be the teacher. 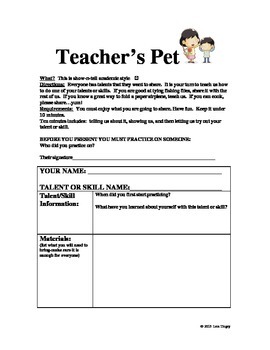 FUN way to allow students to share talents and skills but also keep it academic. This lesson includes a fill out chart that requires the student to think about what they will be teaching and then reflect upon the experience.